3DLab is a simple-to-use, yet very powerful simulation software product that closely replicates a fully functioning electrical/electronics laboratory in a realistic 3D environment. This 3D simulation software is a "virtual reality"-type of lab that combines an interactive 3-dimensional learning environment and "real world" electronic devices and tools, to greatly enhance the user's comprehension of basic electricity and electronics. 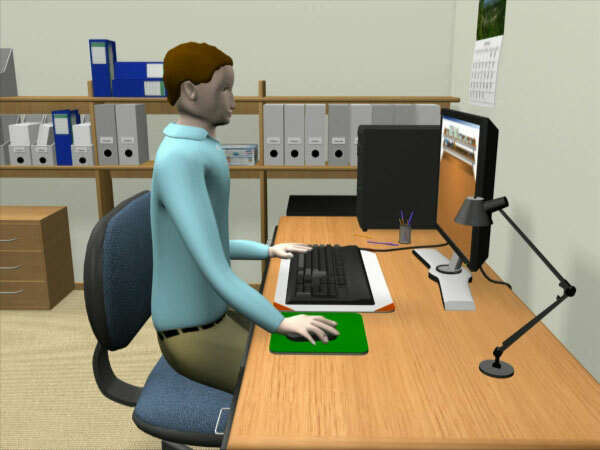 The image and animations below show the basic configuration of the 3DLab simulation environment. 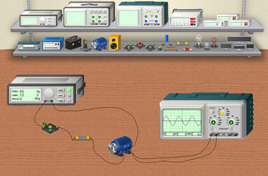 3DLab is intended for the study of basic electricity and electronics, including DC fundamentals, AC circuits and troubleshooting techniques. The user-friendly interface provides a highly intuitive method of observing circuit behavior through use of laboratory experiments and procedures. 3DLab provides a virtual electronics lab where you can design, build, and test electrical and electronic circuits. Placing devices onto the worktable is as simple as moving your mouse. Once you have selected a device off the shelf, left-click again to place the device on the table. To return the device to the shelf, right click on the device with your mouse and move it off of the table. There are approximately 30 different devices and instruments available in 3DLab. These components include batteries, switches, meters, lamps, resistors, fuses, inductors, capacitors and instruments including oscilloscopes, logic analyzers and frequency counters. 3DLab is very easy to learn , and provides an excellent bridge to more complex lab simulation found in the 2D schematic editor in CircuitLogix. In a real lab, you would place components on a work surface and prepare them for interconnection. Wiring would be done either on a breadboard, or by using jumper wires. In the virtual world of 3DLab, parts are selected by picking them off the shelf with your mouse and moving them onto the workspace. Wiring of the circuit is accomplished by using your mouse cursor to draw a wire between two points. To start a wire run in 3DLab, move the cursor toward one of the component’s connection terminals until the cursor changes into a small circle. Left-click with your mouse and begin to draw the wire by moving the mouse cursor towards the next connection point. You can draw along any curve and 3DLab will create a smooth path. Switches and other devices in 3DLab can be turned on or off, opened or closed, by left-clicking on the device with your mouse.